Livin' the Dream: My Water Boy! Josh always tells me that there are dirt boys, fire boys, and water boys. Isaac is definately a water boy! 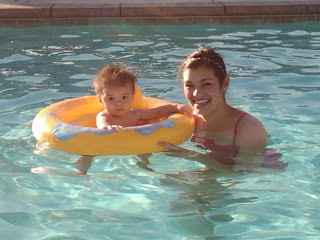 I took Isaac swimming for the first time today! The Shum's invited us to go to a little community pool which was perfect for Isaac's first experience. We were the only ones in the pool. I forgot my camera so Kaulana took a picture on his phone for us. Isaac absolutely loved the pool. He squealed in delight over and over again. He was just crazy about all of that water! The Shum's have a little son named Paxton that Isaac was having fun playing with. They wrestled over a diaper for a little bit and pulled eachothers hair. Just the sort of thing that baby boys do, I guess. It was funny anyway. The only sad part of the day was that Josh couldn't be with us. Kaulana emailed the picture to Josh right after he took it(thanks to modern technology) and when Josh got it he had some mixed emotions...it made him feel like crying, but he thought it was so cute he couldn't help but laugh. He told his co-workers that "I missed my son's first time swimming...my job satisfaction has just gone down." Oh no! That's so sad that Josh said that! : ( Kaulana's missed some small firsts too, but I think that's just part of working out of the home whether he works late or not. Naturally, we're going to catch everything because we're home the whole time. Next time we all go, we'll make sure Josh can come too. : ) I'm glad you guys could come. It was fun to see Isaac enjoy himself in the water. He's a cute little water boy! So does he get his love of water strictly from you or from Josh too? He looks very happy in there though. You now how much i love your little boys hair, it's even better when it's wet!!! Generally people think their kids are the cutest, but I MIGHT be willing to admit your Isaac gives my kids a run for their money.